UAV’s and Wildfire Management—Can Our Firefighters Afford What They Need? Wildfire management in the Western states has become a national issue, straining state’s resources and forcing the Federal Government to steadily commit more firefighting assets and emergency funds to containing the fires and then repairing the damage. ”The Wildfire Season” as a term has become irrelevant; the “season” is now year-around for much of the West. To better utilize firefighting assets and react more quickly and forcefully to developing fire incidents, states and Federal land management agencies have turned to advanced technologies once the sole purview of Defense, technologies such as Unmanned Aerial Vehicles (UAV’s) or “drones” in the popular parlance. Over the last week or so what is now the largest wildfire complex in California’s history has raged in Northern California. 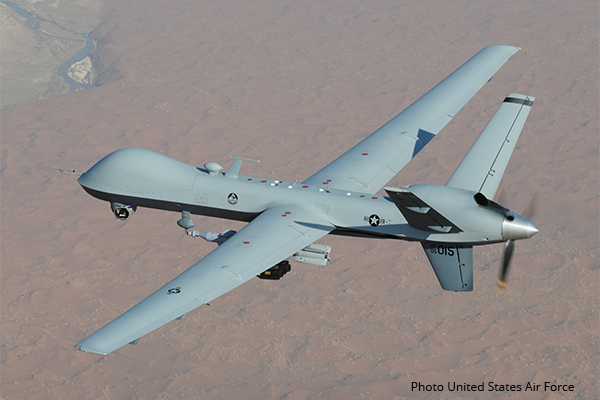 As they have before, the California Air National Guard has stepped in to offer advanced surveillance capabilities with their military grade Predator type UAS systems, this time with their upgrade MQ-9 Reaper. The data provided has been invaluable to Incident Commanders and managers trying to best utilize resources to contain the blazes. Traditionally the size and forward movement of a fire has been estimated from on the ground observations by trained observers. With high resolution imagery and infrared data provided by the Guard, estimates are far more accurate and timelier, and the people who were committed to observations are available for other work. While this is a very productive marriage of convenience, it may ultimately suffer from a divergence of mission. The California National Guard trains and prepares for the time when they may be activated by the Federal Government for deployment overseas. It is actually for this purpose that the Federal Government makes state of the art equipment such as the MQ-9 available to the Guard. There is a very real chance that this resource may one day be unavailable at a very inopportune time. Clearly those entities (Calfire, Bureau of Land Management etc.) that are committed to fighting wildfires that have been increasing in frequency and intensity are well justified when they seek out opportunities to develop organic resources to replace the capability the Guard brings. What might that look like? The good news is that MQ-9 is probably far more capable than needed for wildfire management. The aircraft can operate at 50,000 feet, and uses sophisticated satellite-based technology to downlink near real time video of exceptional quality in addition to other information from its multi-spectral targeting sensor suite (while unconfirmed, it is probable that the data supplied to wildfire managers has been carefully scrubbed of any classified information or details that might indicate the Reaper’s true capabilities). Wildfire managers can probably do with far less, which is fortunate considering the MQ-9’s $16M price tag and minimum aircrew of three, operating from a container-size control center. One real advantage of the military-grade UAV is its ability to operate at altitudes well above normal commercial airspace. Commercial UAV’s, even the larger ones that will be operating eventually in our airspace, will probably not be able to achieve this cost effectively. A UAV is required that can be certified to operate in available airspace, probably between 1,000 and 10,000 feet (this is a guess, operational airspace will need to be assigned). Many hobby-type quadcopters are not equipped to fly at more than a few hundred feet, which puts them down in the restricted zone over the fire. This area is already organized chaos in the air. The Air Tactical Group Supervisor (ATGS) in charge of managing the air assault usually flies well over the incident, the air space within about 150ft of the ground is crowded with spotter aircraft. Lead planes, water-drop helicopters and aerial tankers of various sizes, up to and including the 747 Global Supertanker currently being used to fight California Wildfires. Even an agile quadcopter not controlled by the ATGS cannot operate in this space. Our hypothetical UAV operating above the restricted space over the wildfire still needs excellent sensors, if not as good as those offered by military systems. Good quality video is a natural requirement, even better if that video can be transmitted over the Internet to an incident command center where managers can see what the fire is doing for themselves. Infrared capability is quickly becoming a requirement for when the smoke over the incident is so thick that manned spotter aircraft cannot enter the airspace safely. The drone can be used in those circumstances to “see” through the smoke with infrared to detect hotspots. Terrain mapping with LIDAR can also be very useful to managers trying to calculate a probably speed of advance for the fire. All of these sensor systems require electrical power to operate. Because quadcopters rely entirely on their electric engines for lift, when they are loaded with sensors and video/data transmitters they can be notoriously short on endurance, often less than ½ hour. While quadcopters can hover in place, an essential feature for close inspection, that capability could conceivably be regulated to “nice to have” for wildfire management. Predators such as MQ-9 are fixed wing aircraft for a reason. With the lift capability provided by the wings, performance is much better at higher altitude, and endurance can increase dramatically. Despite difficulties with operating larger UAV’s legally in the US, several companies have developed larger fixed wing UAV’s, including ARES by Shield Aviation, a company recently acquired by Cubic Mission Solutions, the builder of the ARES control systems. Paired with commercially available multi-sensor mounts, these aircraft can fulfill the mission. There are of course issues with deploying fixed wing AUS systems. Fixed wing control systems are similar to conventional aircraft (rudder, stabilizers, flaps etc.) while rotary craft tend to have controls that are more intuitive for the non-experienced user. Fixed wing craft are harder to transport on the ground, and often require substantial assembly on site. Fixed wing aircraft need at least a short runway to takeoff and land. It was this last requirement that led the Department of the Interior’s Bureau of Land Management in a different direction when it decided to expand it’s existing fleet of quadcopters. A few months ago 50 Vertical Takeoff and Landing (VTOL) UAV’s were added to the BLM fleet. The new UAV has a five-foot wingspan and a service ceiling of 12,000 feet. VTOL’s can be launched form small boats and unprepared landing pads. When tipped over into normal flight they have the stability of fixed wing craft. All that said, VTOL’s have traditionally had performance issues. The aircraft expends a lot of fuel getting into the air before it converts, limiting payload. The pilot must master helicopter flying, fixed wing flight, and the delicate transition. It’s not really clear when BLM will want to launch an aircraft with a five-foot wingspan from a boat or a very remote location. BLM is only now deploying 50 of these aircraft, the next few months of operation should prove out the value (or not). Runway space near a fire incident is often not hard to find (in California at least), and there are a number of catapult systems on the market that may provide a solution. Case in point, the BLM is partnering with Boeing subsidiary Insitu to deploy their Scaneagle gasoline-powered fixed wing drone to monitor fires in Oregon. Scaneagle operates at night when other firefighting aircraft are not operating, using infra-red imagery to map fires and locate hotspots. Scaneagle deploys from a trailer-mount catapult, and snags an aerial wire on return. BLM is headed in the right direction. Our federal and state governments need to move past the glamour of quadcopters to embrace solutions with enough capability to take the place of military UAV’s they have been borrowing for wildfire management. Real world experience operating these systems must be developed quickly, as well as standard capability profiles and operational procedures for integrating them properly into wildfire management. Sooner or later, the Guard will be otherwise involved. We must be ready.